VISIT DENVER's 15th Annual Denver Restaurant Week celebrates dining in The Mile High City from Feb. 22 - March 3, 2019. During the 10-day-long Denver Restaurant Week hundreds of Denver&apos;s top restaurants will offer multi-course dinners for three new price points: $25, $35 or $45!. For up-to-date news on Denver Restaurant Week, sign up for emails here or follow Denver Restaurant Week on Facebook. 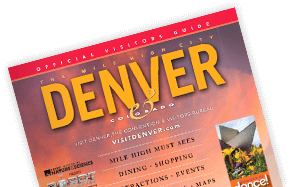 And for more information on what to do and where to go in Denver, follow VISIT DENVER on Facebook, Twitter or Instagram. If your restaurant would like to participate, please register here. For questions please visit our FAQ page here. Tag your food shots with #DenverRestaurantWeek for a chance to be featured. Learn about all of Denver's unique dining neighborhoods including Downtown, Capitol Hill, Larimer Square, LoDo, Cherry Creek and Highlands. Find out all about Denver Restaurant Week and the hundreds of Denver's top restaurants who participate. Sign up to stay current about Denver Restaurant Week and be tuned into the latest dining news from VISIT DENVER. Remember these dining tips when enjoying Denver Restaurant Week.